Hurricane Irma damaged Lucien "Chet" Lebrun's mobile home, and now he could be evicted from his mobile home park if he doesn't make the repairs by Feb. 23. It's not the type of treatment Lebrun expected. "I'm disabled, World War II veteran. I think the government would be coming in here raising hell, you know," Lebrun said. But he doesn't want it to come to that. During the hurricane, his carport blew away, along with the roof of his shed. His gutters and siding are also damaged. His power of attorney, Karen Bingham, said his application to FEMA is held up in the appeals process. She is worried about water seeping inside the walls, creating mold and mildew. 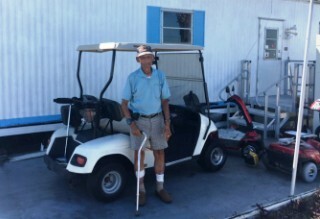 On Feb. 8, his mobile home park, Cypress Shores, sent him a violation notice. The park wants him to fix a list of things including the Irma damage, power washing his home, painting it, replacing the skirting, removing the cement blocks and removing the weeds in the flower beds. "Ever since this company took over this park, it's always been a problem," said Lebrun. Lebrun said he's too old to fix the home himself and he doesn't have the money to pay someone else. "He's on a fixed income. He gets social security and he gets a VA benefit," Bingham said. To fix the hurricane damage alone would cost $8,710, according to an estimate he received from Crumley Construction. Lebrun said he staunchly opposes moving into an assisted living facility. He's hoping somebody out there will help him buy a new mobile home." "The best thing for me is to move to a different park. Then my problems are gone," Lebrun said. Bingham said she's also reached out to Sen. Marco Rubio office to see if he could pressure FEMA to help. She hopes to get a response by Tuesday. In the meantime, she has created a GoFundMe account to help him.